I saw this cute costumed drummer recently in Youtube, she or he is very skilled drummer. She/he has a pattern, starts with normal drumming then in the middle she/he suddenly snaps and begins to change from normal beat into metal beat. She/he is an apple with a cat face, an apple cat. Its name is Nyango Star, I thought it comes from mango fruit, but I think the name comes from Ringo Starr, The Beatles drummer but I don't know. 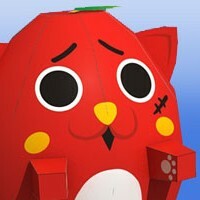 This chibi style of Nyango is about 15 cm high when it fully assembled. Remember Dodo papercraft? 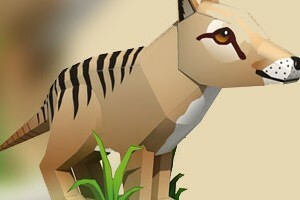 This one is another extinct animal papercraft, it's a Thylacine. Thylacine is a Tasmanian wolf, or some called it Tasmanian tiger because of its tiger-like stripes on its lower back. The wolf was lastly seen and shot in the wild in 1930, but there are still many report of its sightings until now. It was native animal in Papua, Australia and the last was Tasmania until it extinct because of hunting, introducing of dog and diseases. The papercraft template consist of 2 pages of patterns, when it's completely done it will has 17 cm (6.7 inches) height. After almost a month I was not update this site, I think I must post a few quick update. After that Stearman Biplane I think simple animal template will be a refreshing. Actually guinea pig is requested a long time ago when I finished completing puppies model paper craft template which also simple model. 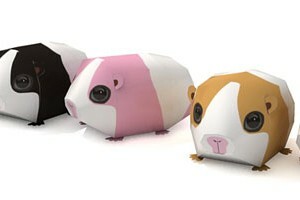 You can make your own cute guinea pig, all 5 of them without to worry to provide them food. There are 5 pages and a guinea pig with different color in each page. 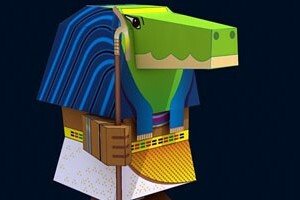 This is the fourth god to be added to the god and goddess of ancient Egypt paper craft collection. Sobek is a Nile river god, often depicted as a true crocodile or a man with crocodile head. He is a vicious, savage and wild god, wild as an animal but in the same time has soft sides, like protecting his child and treat them gently by transporting the young ones inside his jaw, among his sharp pointy teeth. Reflect the love of god to his worshiper. People of ancient Egypt especially on Faiyum region worship and rely on him for protecting them especially from the danger of the Nile river. There are many Sobek temple and crocodile mummies backed up that theory. If I'd go to Egypt tour I'll search that area. In one era, Sobek also fused with Horus as a Sobek-Ra, a solar deity in the New Kingdom (1550—1069 BCE). There are already 3 god and goddess available in the collection that you can find here, there are : Horus, Anubis and Bastet. This is a rubber duck, no this is not. This is a paper duck, no this is not either. This is a rubber duck paper craft, now that is correct :). I already said this on the first day of new year 2014, I will try to make more models update every week this year, spread out on the various existing categories. 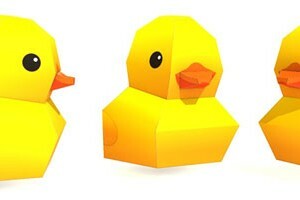 This rubber duck just came out in my mind and it is reasonably possible to make a simple paper craft of it. So I made this single page paper craft pattern for filling simple paper craft category.